Five Stars from Web User Magazine! We received some rather fantastic news today - our new website, which went live last month, has received a perfect five-star review from Web User, the UK's leading internet magazine! The review praises our "huge range of products" and calls the site "a pleasure to browse" - they even like the way we interact with people on Twitter! Alternatively, head over to our home page to see our full selection of gadgets and gift ideas. Talking Minion Toys - Order Yours Now! Everybody loved the Despicable Me films, right? And everybody is SUPER excited for the Minions movie that's slated for release next summer, right?! Yes, our Inflatable RC Minion toy is BACK IN STOCK, and he's had a big of a makeover since last time he was here. For one thing, he looks a lot more like his movie counterparts now - who could resist those big brown eyes and that adorably cheeky grin? But that's not the only improvement, no sir. The best thing about our new minion toy is not how he looks...but how he sounds. That's right: this is a TALKING minion toy, and he's just itching to say hello to you! He says nine different phrases, all in the original minion voice from the movies. Being a minion, most of what he says is gibberish, but recognisable sayings include "Banana! ", "Whaaat?" and "Woohoo! ", along with various laughing, kissing, sighing and babbling noises. Of course, some things don't need to be changed: our minion toy is still super-cute, super-squishy, and very easy to inflate. You can play with him anywhere - indoors or out - and the RC controller allows you to steer him forwards, backwards, left or right. He can perform 360-degree pirouettes, and if he falls down, he'll get right back up again, all by himself! So what are you waiting for?! The Talking Minion Toy is just £39.99, and he's sure to make a fabulous gift for the kids this Christmas. Order yours now! "My superhero loving 7yo daughter not impressed when she spotted this sign in @Tesco today @LetToysBeToys"
Tesco apparently didn't realise that one's appreciation for superhero-themed clocks isn't necessarily dictated by one's gender. The offending sign has now been removed, but let's face it - the 'Fun gifts for boys' banner is merely the tip of a much larger iceberg. Now, we're a gadget website, and a lot of our products are prone to being described as "boys' toys". We do our best, however, to stay away from this sort of thing - you don't need a Y chromosome to enjoy flying a quadcopter or building your very own Tetris Light. Besides, it's hardly in our best interest to nudge half of our potential customers out of the picture! This awesome quadcopter does just about everything - it flies, it shoots water, it fires missiles, and it even performs 360-degree flips! Some women own smartphones, we're told, and so this pen - which doubles as a smartphone charge and triples as a touchscreen stylus - could well come in handy. This rad little speaker is designed for use with smartphones, laptops, and the like. Plug in your audio device, adjust the bass/treble knobs to your liking, and hit the heavy metal! We love these DIY-themed bar tools - it's just a shame that they come with a Yorkie-style 'No Girls Allowed' sticker on the case. Still, we're the ones selling the product, and we know that women like the odd drink as much as men do. If you want to buy these things, go right ahead - we're not going to check your damn gender. Oh, incidentally, we also have a wide range of superhero stuff. If Friday the 28th of November isn't already marked in your calendar, we'd advise you to go and put a big red circle around that date right now. Why? Because it's Black Friday, silly! Black Friday, of course, is one of the single biggest shopping days of the year, and while it started - as many things do - in the USA, it has long since spread across the Atlantic and established itself as a pretty big day for British retailers, too. All of your favourite shops and websites will be running big discounts this Friday, and we at Gadget Inspector are no exception. Still, we don't want to stuff all the fun into one day, and besides, it seemed a shame to keep y'all waiting. Here, then, are EIGHT awesome deals for Black Friday week - beat the rush and place your order now! Save £24 on your Micro Drone! Save almost £5 on Christmas onesies! Hovva Copter Pro: More than 20% off! Clocky, the running and jumping alarm clock, is down from £40 to £24.99! Save £9 on this awesome bubble-blasting RC helicopter! Brew 10 pints of your very own cider for just £12.99! Drinking Snakes & Ladders: Half Price! These amazing deals won't last forever, and nor will our stock - so be fast! Gadget Round-Up: Loads of New Stuff! We're always adding new items to the Gadget Inspector catalogue, and this week has been particularly busy in that respect. Here, then, is a quick round-up of all the new products we've brought in over the past few days; could these be the perfect Christmas presents that you've been searching for? A super-comfy inflatable chair with built-in speakers for a truly immersive gaming experience. Other features include sunken cup-holders in both arms, a magazine pouch, and handy pockets for pretty much everything. Not a new product, per se - more a beloved oldie that's finally back in stock. Don't forget the attachable camera! Listen to your favourite albums in the shower with this wireless, splash-proof speaker! It even has a hands-free phone feature, allowing you to take phone calls while you wash that beautiful bod of yours. 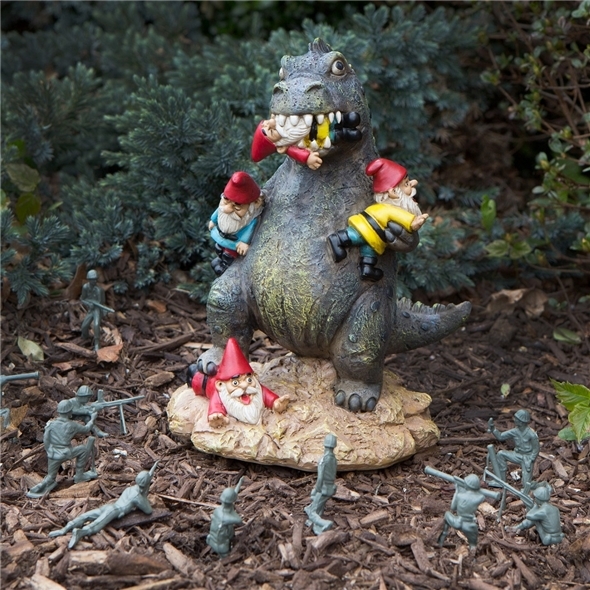 Part garden ornament, part hilarious homage to classic monster movies, The Great Garden Gnome Massacre is a fabulous alternative to those boring old gnomes that everyone else has. 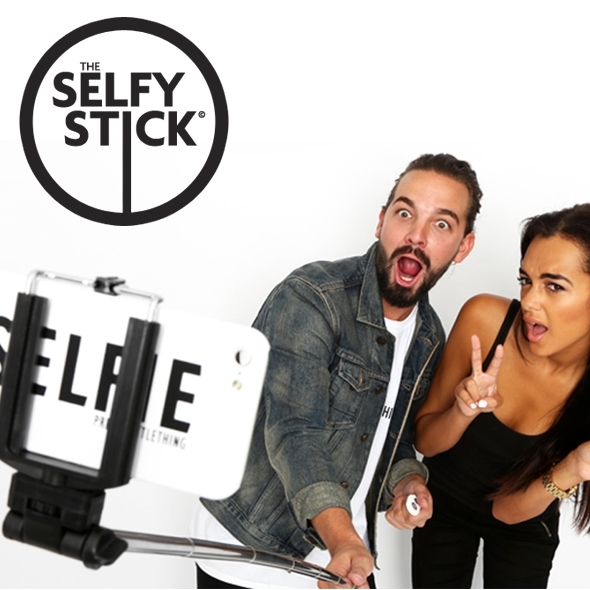 The must-have accessory for any selfie addict. See yesterday's blog for more information. This is actually three gadgets in one - it charges your smartphone, it works as a touchscreen stylus, and it...uh, writes like a standard ballpoint pen. 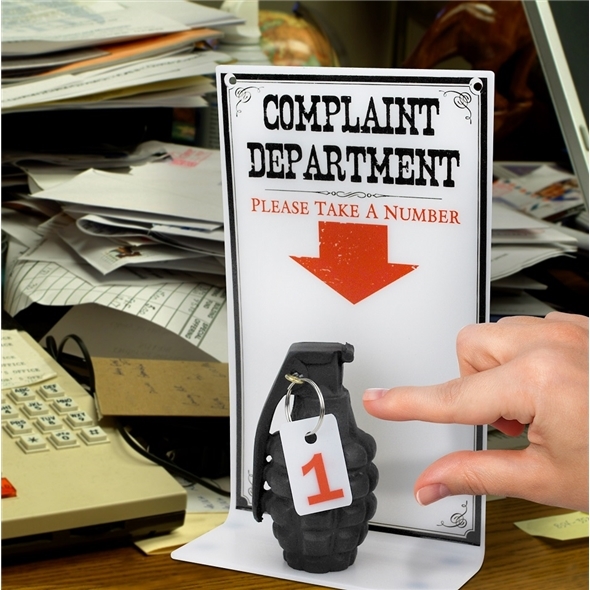 Here's a fun ornament for the office - nobody will dare to bother the boss when he's got this perched outside his door! Love beer? Love The Simpsons? Then you'll, like, double-love this awesome mug. You can literally freeze it, resulting in the coolest, most refreshing drink you've ever had! 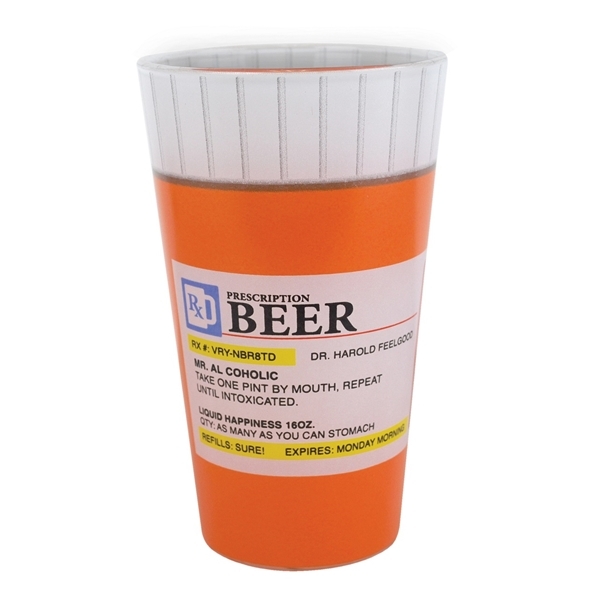 Speaking of beer, here's another cool receptacle for your brews - a pint glass with a prescription on it! Now everyone will believe that you doctor tells you to drink beer after beer after beer. Has your all-consuming Game of Thrones addiction left you itching to wield a Joffrey-esque crossbow of your very own? You need one of these babies. See also: Petron Stealth Archery Set. 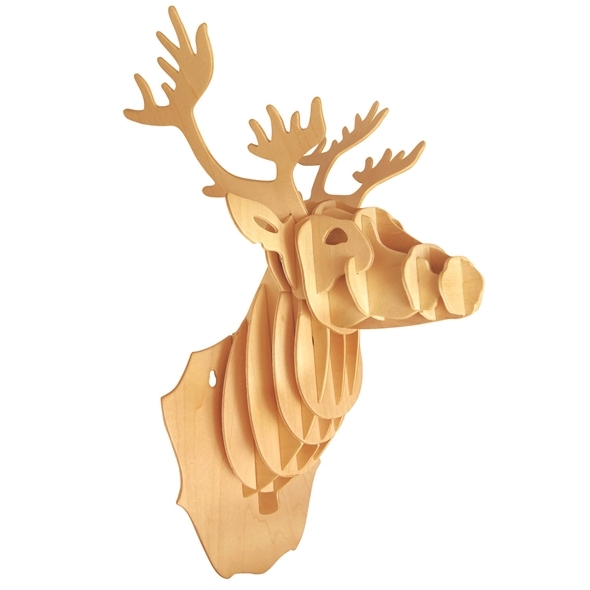 Perfect for animal lovers who nevertheless really want a stag's head on their wall. Pop out the pieces and build it yourself! Keep your wine fresher for longer with these colourful cork-type thingies! Finally, we have this abomination. 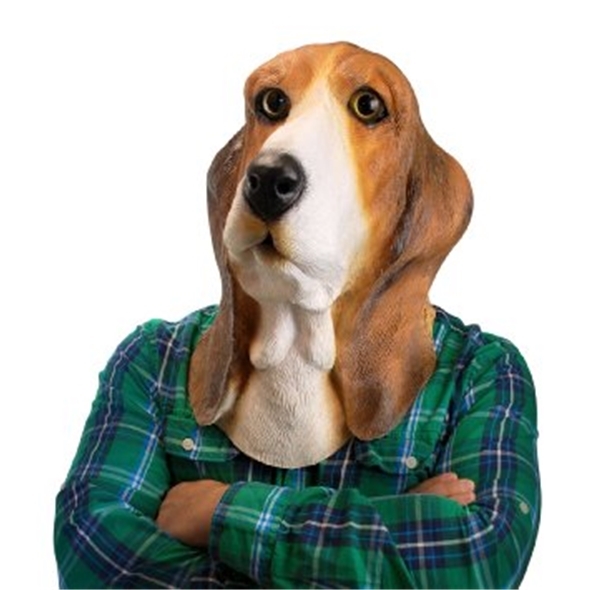 It's not quite as scary as the Cat Mask, but still, it's definitely in the same ballpark. Still not sure what to get that special someone this Christmas? Ask us for a recommendation on Twitter!